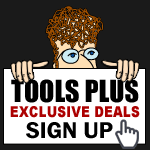 Our Tools Plus Exclusive Deals is designed to provide exclusivity to the subscriber. By signing up you can look forward to receiving: exclusive deals, mail-in-rebate offers, industry news, helpful tips, and insider information given to us before the general public. Knowledge is power and savings, and we will go to every extent to make sure that you can achieve both. Note: We will NEVER share this information with anyone! See our Privacy statement.